Matthew Abeysinghe came up with the highest achievement by a Sri Lankan swimmer at the Asian Games. Matthew Abeysinghe came up with the highest achievement by a Sri Lankan swimmer in Asian Games history when he competed in the men's 100m final and finished in sixth place clocking 49.28secs at the 18th Asia Games continued in Jakarta yesterday. Matthew was also the first Lankan swimmer to qualify for an Asian Games 100m final. Matthew had earlier recorded a better timing of 49.11secs at this year's Commonwealth Games in Australia. 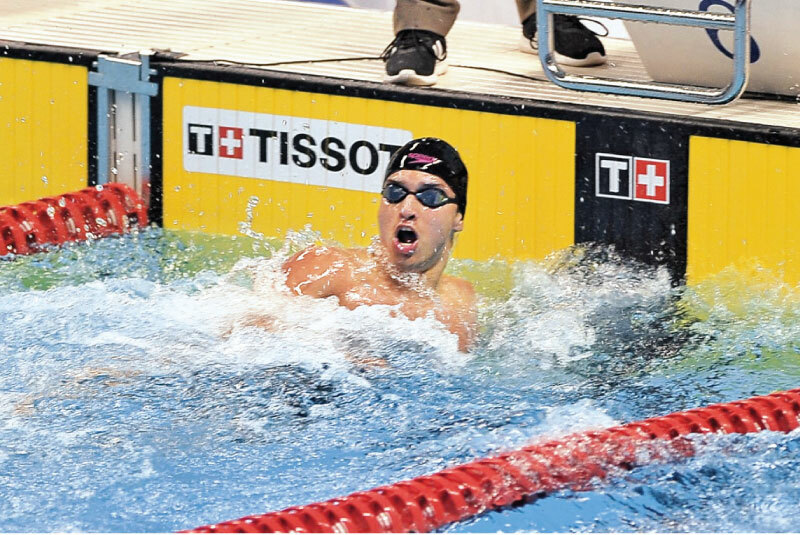 He qualified for the final slot as overall fourth out of 48 swimmers. Japanese swimmers dominated the event with Shinri Shioura and Katsumi Nakamura clinching the gold and silver medals respectively. Matthew also admired his brother Kyle's performances and said he will go back to America and continue practices. Kyle who came fifth in same event preliminaries ended up 13 overall. Sri Lanka men's volleyball team tamed the strong Vietnam counterparts 25/23, 25/18, 25/18 at the Bulunga Indoor Stadium. Vietnam defeated strong Chinese opponents in their first match before they went down to Sri Lanka. Akalanka Peris competing in the 200m back-stroke preliminary round second race clocked 2:12.14secs to finish sixth. He was placed 16th overall out of 22 swimmers. Akalanka and Cherantha de Silva competed in the 50m butterfly-stroke preliminaries but were unable to make it to the final. Kumudu Kalpani who competed in the women's 49kg weight class taekwondo event quarterfinal round beat her Pakistan rival 28-14 and qualified for the semi-final round. But she was edged out by the Japanese Miyu Yamada 32-8 in the semi-finals. Lankan archer Sajeewa de Silva entered the quarterfinal round of the men's individual event by beating Roshan Nagarkoti 6-0. He however failed to enter the semis going down to Chunheng Wei (Chinese Taipe) 6-2. The men's kabbadi event saw Sri Lanka going down to Korea after a tough battle 33-22. Sri Lanka dropped out while Korea, Iran, India and Pakistan advanced to the kabbadi semi finals. Qatar beat Sri Lanka 2-0 in the beach volleyball event and with this defeat the Lankan team comprising Asanka Pradeepkumara and Sashimal Malintha go out of the competition. Lankan squash players too savoured bitter defeats in yesterday's matches. Vakheel Shamil was trounced by his Indian opponent 3-0 in the men's singles event while his team mate Ravindu Laksiri went down to his Malaysian opponent 3-0 in the same event. The women's singles squash event saw Fathima Issadeen and Mihiliya Methsarani losing their games 3-0 to their Japanese and Malaysian opponents respectively. Sri Lanka's final preliminary round squash match will be worked off tomorrow against China. Sachin Dias and Thilini Hedahewa went down to Vietnam pair 1-2 in their first badminton event of the Games. Kavindi Ishadika beat Shatha Almutairi (Saudi Arabia) 2-0 in the women's singles event and entered the quarterfinal round. But her team mate Thilini Hedahewa was defeated by Indonesia's Fitriani 2-0. The men's doubles event saw Sachin Dias and Bhanuka Gunathilaka going down to Ngai Che Pang Fong (Macao) 2-0. Niluka and Dinuka Karunaratne brothers were defeated by Solgy Choi and Minhyuk Kang (Korea) 2-0. Kavini Sirimanne and Thilini Hendahewa lost the women's doubles match against Jinhua Tang and Zheng Yu (China). The Lankan baseball team was handed a shock 3-14 defeat by Thailand. Lanka men's hockey team will take on Hong Kong while the men's basketball team will battle with Vietnam and Indonesia. Another Lankan medal hope boxer Keshani Hansika Kasthuriarachchi will enter the ring today in the 57kg weight class.